Scroll down past the lists for a great giveaway and more ideas. Science, as well as technology and engineering, are the things that seem easiest to make hands-on games for. So many picture books explore scientific concepts already: it’s just a matter of finding the science and exploring it further with your preschool. 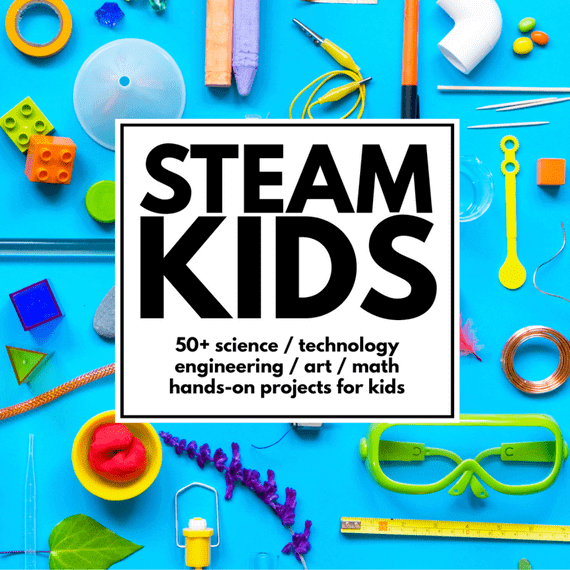 Here are some great preschool picture book lessons dealing with science, technology, and engineering. Horns to Toes and In Between by Sandra Boynton. Get book. Can you find-[name the body part]-? game. Skeleton Hiccups by Margarey Culyer. Get book. Make a cotton swab skeleton. Fall Mixed Up by Bob Rascka. Get book. Learn about the fall season and sort the truth from the silly. Froggy Gets Dressed by Jonathan London. Get book. Dress a weather bear for the seasons. Little Cloud by Eric Carle. Get book. Learn about different types of clouds (cumulus, cirrus, stratus, cumulonimbus) and make a cotton cloud craft. Cloudy with a Chance of Meatballs by Judith Barrett. Get book. Imagine a crazy weather day. All the Water in the World by George Ella Lyon. Get book. Make it rain in the kitchen or make a water cycle in a bag. Pancakes, Pancakes! by Eric Carle. Get book . Learn where milk, flour, butter, eggs, etc. come from and make butter. Planting the Alphabet by Lois Ehlert. Get book. Compare and contrast seeds. Tops and Bottoms by Janet Stevens. Get book. Learn about the vegetables we eat. A House for Hermit Crab by Eric Carle. Get book. Learn about a unique habitat with imagination play. The Ugly Duckling by Hans Christian Andersen and Jerry Pinkney. Get book. Learn about the duck and swan’s cycle of life. Fly, Monarch, Fly! by Nancy Elizabeth Wallace. Get book . Act out the butterfly life-cycle with a whole body game. Are You My Mother? by P.D. Eastman. Get book. Sort alive or not and match mothers to babies. Papa, Please Get the Moon for Me by Eric Carle. Get book. Learn about phases of the moon and dance in a gross motor activity. Ducky by Eve Bunting. Get book. Determine which items sink and float. The Snowy Day by Ezra Jack Keats. Get book. Run a snow melting experiment by testing how long it takes a snowball (or ice cube) to melt in various places: table, fridge, outside, freezer. The Cat in the Hat by Dr. Seuss. Get book. Try to balance like the Cat in the Hat. Dreaming Up by Christy Hale. Get book. Use blocks to build. I Spy with My Little Eye by Edward Gibbs. Get book. Make your own “I spy” by taking pictures of things and hiding in a sensory bag. Describe something with specific adjectives for a friend to guess. If I Built a House by Chris van Dusen. Get book. Design a house (or castle!) by looking in magazines and clipping images for ideas. If I Built a Car by Chris van Dusen. Get Book. Design the car of your dreams. Chickens Aren’t the Only Ones by Ruth Heller. Get book. Sort animals by whether or not they hatch from an egg. The Umbrella by Jan Brett. Get book. Learn about the animals of South America. Over and Under the Snow by Kate Messner. Get book. Learn about animal hibernation with a gross motor activity. Mathematics, geometric concepts, and colors are all around us. 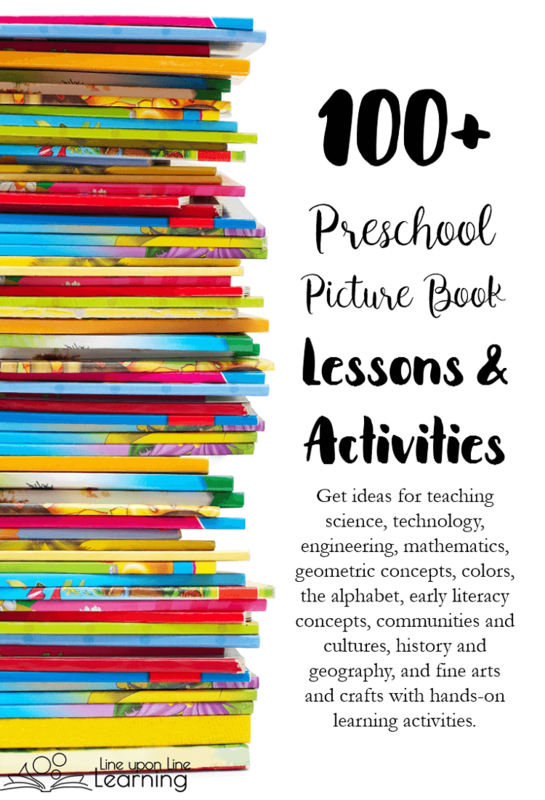 Preschool picture book lessons can be naturally developed from reading favorite picture books! Pete the Cat: I Love My White Shoes by Eric Litwin. Get book. Practice matching colors. Freight Train by Donald Crews. Get book. Practice putting the numerals 1 to 10 in order with a number train. My Heart is Like a Zoo by Michael Hall. Get book. Make animals out of heart shapes. Ten Apples on Top by Dr. Seuss. Get book. Count to 10 with a hands-on activity. Big Red Barn by Margaret Wise Brown. Get book. Count eggs in the book and learn number concepts using eggs. Pancakes for Breakfast by Tomie DePaola. Get book. Practice measuring and cooking pancakes. Nine Ducks Nine by Sarah Hayes. Get book. Learn counting down from 9. Ten Terrible Dinosaurs by Emily Strickland. Get book. Learn to count down from 10 and play a gross motor game. Crossing by Philip Booth. Get book. Learn the concept of 100 and make a paperclip train. One Hundred Hungry Ants by Elinor J. Pinczes. Get book. Learn the concept of 100 and make arrays. Lemonade in Winter by Emily Jenkins. Get book. Learn monetary units and practice counting in a lemonade imagination station. This Plus That by Amy Krouse Rosenthal. Get book. Learn that the concept of addition is putting two things together. Chrysanthemum by Kevin Henkes. Get book. Count the letters in the names of family and friends. In addition to reading a straight out alphabet book, here are some creative preschool picture book lessons that encourage alphabet play even more. Chicka Chicka Boom Boom by Bill Martin, Jr. Get book. Recognize letters with an ABC tree. The Monster who Lost His Mean by Tiffany Strelitz Haber. Get book. Name letters as you feed an ABC monster. Z is for Moose by Kelly Bingham. Get book. Put on an alphabet performance with toys and dolls. AlphaOops! The Day the Z Went First by Alethea Kontis. Get book. Practice putting letters in alphabetical order. If Rocks Could Sing by Leslie McGirk. Get book. Go for a walk and find letters in nature. Alphabet Adventure by Audrey Wood. Get book. Search for lower case “i”s (or any other “letter of the day” you choose). Q is for Duck by Michael Folsom. Get book. Think of creative things that begin with each letter of the alphabet. Kipper’s A to Z by Mike Ingpen. Get book. Make alphabet letter boxes. Alphabatics by Suse MacDonald. Get book. 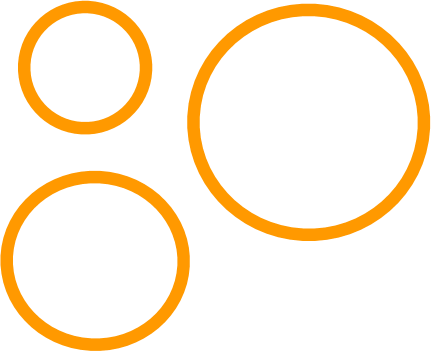 Design something from a letter shape that starts with the selected letter. Alphabet City by Stephen T. Johnson. Get book. Find letters in your city or town and take photos of them to make your own book. How to Build an A by Sara Midda. Get book. Create the letters with arcs and straight lines. Preschool picture books are perfect tools for learning some basic early literacy concepts. Here are some of my favorite books and play ideas for exploring words and stories. Rhyming Dust Bunnies by Jan Thomas. Get book. Play a rhyming game. Green Eggs and Ham by Dr. Seuss. Get book. Find the words that rhyme. Goodnight Moon by Margaret Wise Brown. Get book. Find the words that rhyme. One Duck Stuck by Phyllis Root. Get book. Find the words that rhyme. Make Way for Ducklings by Robert McCloskey. Get book. Practice story sequencing. Farmyard Tales. Get book. Retell with stickers. Brown Bear, Brown Bear, What Do You See? by Bill Martin, Jr. Get book. 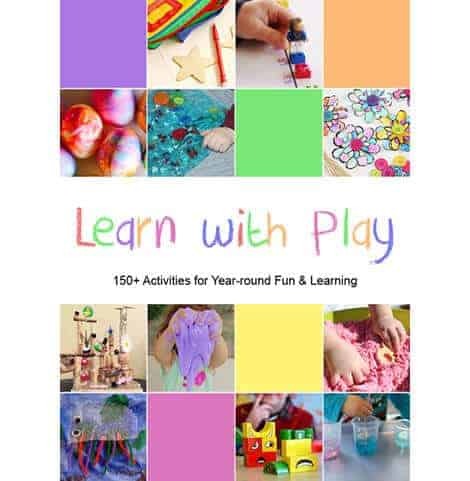 Make your own booklet by using your own toys. Storm Song by Nancy Viau. Get book. Find words that sound like what they are (onomatopoeia). Don’t Let the Pigeon Drive the Bus by Mo Willems. Get book. Write a persuasive paragraph (with teacher help). One Special Day by Lola M. Schaefer. Get book. Notice metaphors and create your own animal metaphor. Two Bad Ants by Chris Van Allsburg. Get book. Notice the metaphors on the page versus pictures. Goldilocks and the Three Dinosaurs by Mo Willems. Get book. Retell a Goldilocks story in a new setting. Lift the Flap Colors. Get book. Make your own lift-the-flap book. Spooky Old Tree and Inside, Outside, Upside Down by Stan and Jan Berenstain. Get book 1 and get book 2. Practice relational words with gross motor. My Best Friend is Sharp as a Pencil by Hanoch Piven. Get book. Learn about similes and metaphors and try writing your own. Yo! Yes? by Chris Raschka. Get book. Learn about the role of exclamation points versus question marks. Have a conversation. 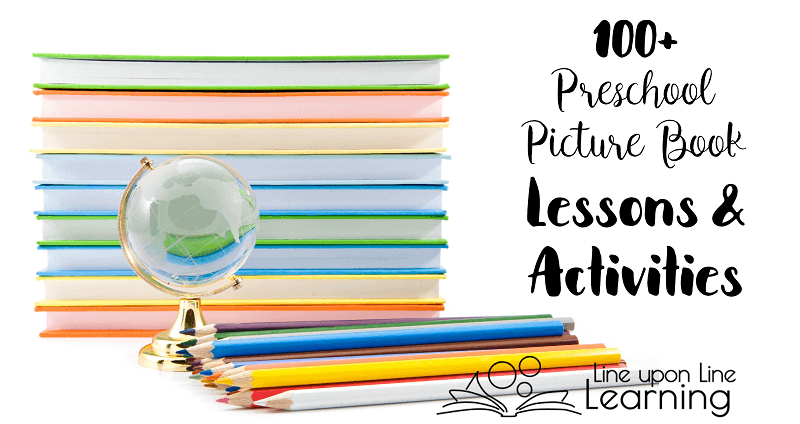 We cannot all travel around the world, but by using some of these preschool picture book lessons, your child can learn a little more about the world. The Very Hungry Caterpillar by Eric Carle. Get book. Learn the days of the week. Chicken Soup with Rice by Arnold Lobel. Get book. Learn the months of the year. Berenstain Bears on the Job by Stan and Jan Berenstain. Get book. Match community workers to their place of work. LMNO Peas by Kevin Baker. Get book. Learn about workers around our communities for each letter of the alphabet. Cars and Trucks and Things that Go by Richard Scarry. Get book. Learn about maps and community by playing with vehicles in a town. In the Snow by Hu Voun Lee. Get book. Learn to write Chinese characters (in the snow, if possible!) or practice English characters in the snow. Scuffy the Tugboat by Gertrude Crampton. Get book. Learn where local rivers lead. Play with a boat at a local river or stream. I Stink! by Kate McMullan. Get book. Learn about your local garbage collection. Where does it go? What are alternatives? (i.e., recycling.) Collect the garbage. Preschoolers are not always ready to learn about the ugly sides of history, but learning about history in a general way with some of these history and geography preschool picture book lessons helps them find their place on earth and in a world timeline. The Gingerbread Man Loose in the School by Laura Murray. Get book. Learn about maps and play hide-and-seek with a gingerbread man. Me on the Map by Joan Sweeney. Get book. Learn about local geography, maps, and globes. Paul Bunyan by Steven Kellogg. Get book. Learn a few major geographic points in the USA. How to Make an Apple Pie and See the World by Marjorie Priceman. Get book. Find places on a driveway-sized world map. Scrambled States of America by Laurie Keller. Get book. Find favorite states on a map. Are We There Yet? by Alison Lester. Get book. Trace where the characters in the book traveled on a map of Australia. Honey, Honey, Lion by Jan Brett. Get book. Learn about the animals of the Savanna and play a game of telephone to see how messages sometimes get mixed up when they travel through many people. George Washington’s Teeth by Deborah Chandra and Madeleine Comora. Get book . Subtract how many teeth George Washington lost through his life and count your own teeth. Then and Now by Heather Amrey. Get book. Compare the past to now with feather/quill painting. Now and Ben by Gene Barretta. Get book. Learn about Ben Franklin and play in an imaginary home library. We the Kids by David Catrow. Get book. Decide what rights you have are most important and sign your name on it. Covered Wagons, Bumpy Trails by Verla Kay. Get book. Make a covered wagon out of a milk carton. Make a pool noodle covered wagon with your little red wagon. Martin Luther King, Jr. by Marion Dane Bauer or We March by Shane W. Evans. Learn how Martin Luther King, Jr. made a difference in his community and brainstorm ways you can too. The Golden Rule by Ilene Cooper. Get book. Learn how many world communities adapt a common courtesy/rule to treat each other nicely. Fireboat by Maria Kalman. Get book. After learning about the fireboat on 9/11, play with water guns in water to put out a pretend fire. Duck for President by Doreen Cronin. Get book. Learn about the election process and hold a mock vote with family or friends. Arts and crafts are always the delightful part of a preschooler’s day. 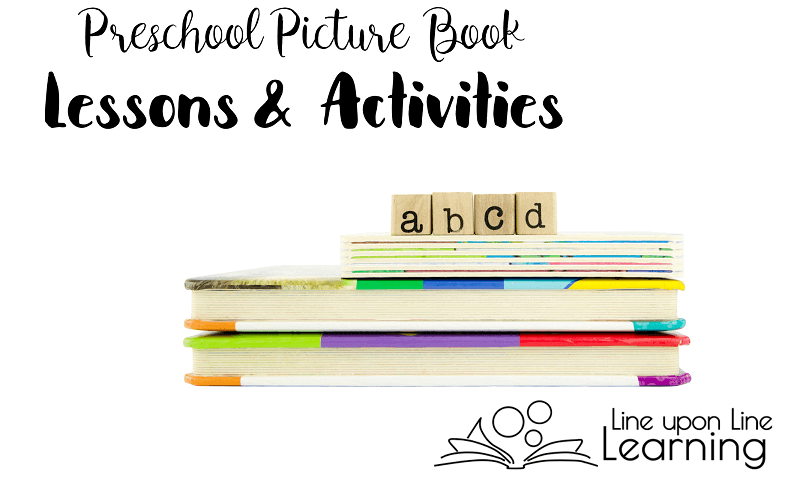 Let’s encourage the exploration of art, music, performance, and more with these preschool picture book lessons. Big Rain Coming by Katrina Germein. Get book. Make aboriginal style art work. Zin! Zin! a Violin! by Lloyd Moss. Get book. Learn about different instruments. I Spy: An Alphabet in Art by Lucy Micklethwait. Get book. Find things that start with each letter in famous works of art. Hand, Hand, Fingers, Thumb by Al Perkins. Get book. 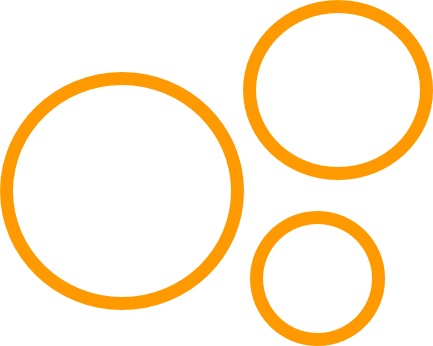 Design your own drum and practice drumming. I’m a Hungry Dinosaur by Janeen Brian. Get book. Make your own chocolate painting. The Friendly Beasts by Tomie DePaola. Get book. Make a nativity sensory craft. I’m a Dirty Dinosaur by Janeen Brian. Get book. Make your own mud painting. A Rainbow of My Own by Don Freeman. Get book. Make a cut-and-paste paint chip rainbow. Zoo Flakes by Will C. Howell. Get book. Make animal shaped snow flakes. Not a Box by Antoinette Portis. Get book. Decorate a box and imagine. The Magic Flute by Kyra Teis. Get book. Listen to music from the opera and/or make a “reed flute” with straws. Where the Wild Things Are by Maurice Sendak. Get book. Hold your own wild rumpus. The Color Kittens by Margaret Wise Brown. Get book. Play with color mixing. Lines that Wiggle by Candace Whitman. Get book. Make your own wiggle drawing. Perfect Square by Michael Hall. Get book. Make your own creation out of a square. That is a lot of different books! I’d like to give a lucky reader a preschool picture book lesson set! I’m sorry this giveaway is only open to residents of the USA. I will send a lucky preschool parent or teacher my Ducks picture book lesson set, as well as these books: Make Way for Ducklings, Ducky, and Just Ducks. 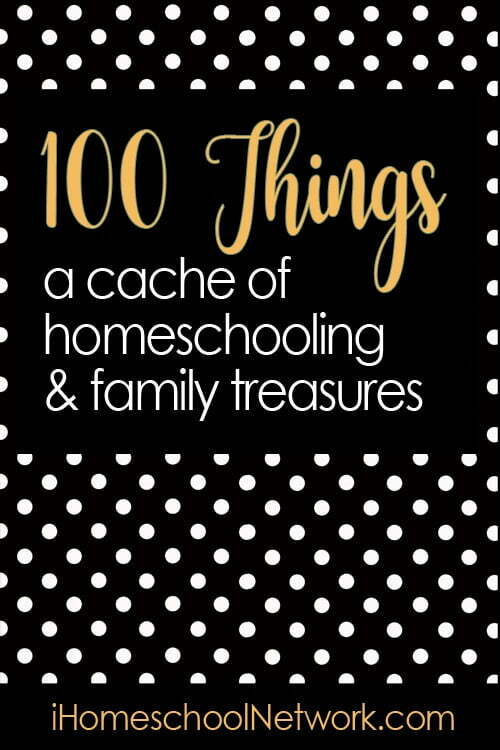 See more lists of 100+ Things and more giveaways from my friends at the iHomeschool Network. I use a lot of these books with my students. A lot of them can be enjoyed by most elementary aged children. My students love read alouds and most of these are already in my classroom. Thanks for compiling such a great list! My children LOVE Make Way for Duckling!